David Hueber has been around the golf industry for four decades, a lot of the time holding very responsible positions including a stint as president and CEO of the Ben Hogan Company. This gives him a unique vantage point to view and review the industry from course operations to real estate development to the actual manufacture of golf clubs and his book tells some very interesting tales. 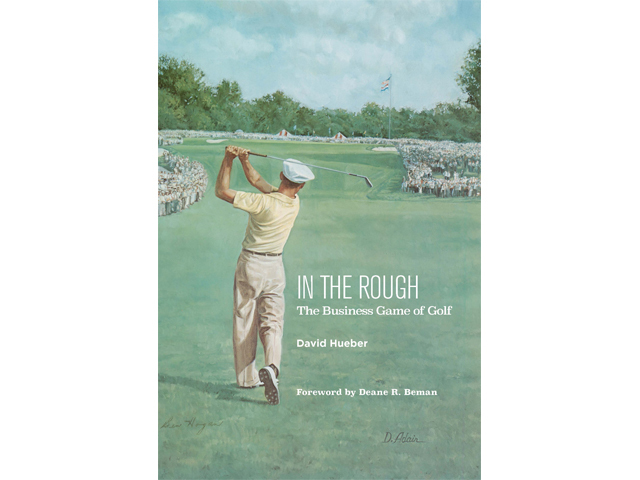 In the Rough: The Business Game of Golf relates Hueber’s journey in golf beginning as a caddie at the club where his father was the professional and where he learned to play well enough to get a scholarship to Florida State University. He describes his time on the FSU team as, “I played without distinction,” but it was enough to convince him though career as a touring pro may have been out of his reach he wanted to be in the golf industry in some way. An entry level job with the National Golf Foundation gave him the chance to see the inside of course development, meet Karsten Solheim the founder of Ping and hear the stories of other golf equipment pioneers including Gary Adams of TaylorMade, Tom Crowe of Cobra and Ely Callaway of Callaway Golf. These incidents are all interesting but when Hueber took a job working for Deane Beman at that time Commissioner of the PGA Tour his experiences become a lens to the changes in the golf industry. Best known as the head of Ben Hogan Company when it was owned by Japanese entrepreneur Minoru Isutani’s Cosmo World, Hueber also ran Pebble Beach as president of Ben Hogan Properties, another of Isutani’s companies. Isutani preferred to stay behind the scenes but hit the news in an unfortunate way when it was revealed he sold Pebble Beach for $350 million less than he paid. From this reviewer’s perspective there are two extremely interesting parts to “In the Rough” that will attract the attention of most everyone who loves the game. First is Hueber’s description of the comedy of errors and tragic misjudgment from which none of the participants came away unscathed, the “Square Grooves Controversy” between Karsten Solheim and the PGA Tour and the USGA. The offshoot of which almost 30 years later in his view is an ineffectual USGA reacting to changes in technology and struggling to control the performance of today’s golf balls and clubs. An unforeseen result of which are the 7,000 plus yards long real estate development dominated golf courses that are essentially unplayable by the average golfer. Then there are the many enlightening anecdotes and stories of Hueber’s relationship with Ben Hogan, perhaps the most enigmatic and dominant players of all times, who still came into the office everyday even after selling out to AMF in 1960. Heuber even tackles an explanation of Hogan’s so-called swing “secret” which allowed “The Wee Ice Mon,” as the Scots called him, control like no other player over the distance and trajectory of his shots. This at a time of persimmon headed drivers and of rubber band-wound liquid center golf balls so lacking in quality control a player was fortunate to find three or four in a dozen that were round and would fly properly. Hueber’s personal history is interesting but what makes In the Rough: The Business Game of Golf worth reading is the insight he provides to the events and some the biggest names in the game.